Want to live a much, much longer and healthier life and maybe even both at the same time? The fountain of youth might never be found, but something interesting was discovered in the small village of Acciaroli in Italy. According to the New York Post, "Acciaroli has a population of only 2,000, yet the village boasts some 300 elders who have reached the age of 100 - and about 20 percent of those centenarians have reached 110. Furthermore, the area has low rates of Alzheimer’s and heart disease - despite a diet filled with cigarettes and wine." The secret to their longevity it seems, is that they tend to eat a lot of the herb... Rosemary! Well, what if you don't want to be munching on a lot of rosemary all day? What if you could just simply drink it? David Spencer-Percival was also intrigued by this story of Acciaroli, Italy and decided to create this cool new No.1 Rosemary Water. 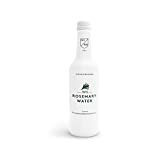 This is the world's first beverage to combine pure fresh organic rosemary extract with all of the essential properties of the medicinal herb retained and certified natural spring water (pH 7.5 alkaline). The result is a refreshing and flavorful way to drink in the health benefits of rosemary, like improved circulation and memory... and possibly even a longer life. If all else fails, it might also make a unique cocktail mixer as well. Check out this video to watch a short documentary about the small village of Acciaroli and the creation of this interesting new beverage. It's worth a shot, right?